The SOLFRUNT 1901 process gauge is available in 4 ½” or 6” gauge sizes, with an aluminum back-flanged case for applications needing stem or wall mounting. These gauges are available with wetted surface material in brass/phosphor bronze. The 4½" size is available as a dry or liquid filled pressure gauge from the factory or your local stocking distributors, or can be ordered with a liquid fill kit for filling in the field. Model 1901 SOLFRUNT process gauges are supplied in many different ranges, including vacuum, compound gauge, and psi gauge pressure ranges from 30" Hg vacuum through 1000 psi. Dials are available in psi gauge or metric versions. The low-connected aluminum back-flanged case can be easily liquid filled in the field using the appropriate conversion kit. Gauge size: 4 ½” and 6. 1901 and 1931 Specification Sheet 4 ½"
Order Code: LG, LS, or LM - Extend the life of your pressure gauges. 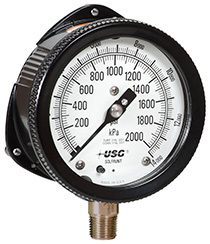 Liquid filled pressure gauges are generally recommended over dry gauges due to performance and durability. When USG’s liquid filled gauges are filled with Glycerin (LG), Silicone (LS), or Mineral Oil (LM) you’re helping to prevent gauge failure commonly caused by excessive vibration or pulsation. Glycerin is the most common fill fluid and is typically used for room-temperature applications. Silicone is used for more extreme temperature applications. Mineral Oil can also be used for higher temperature ranges.